Tzevenos Hotel Apts is a family-run hotel in Agios Georgios (St. George) in South Corfu overlooking the turquoise waters of the Ionian Sea. 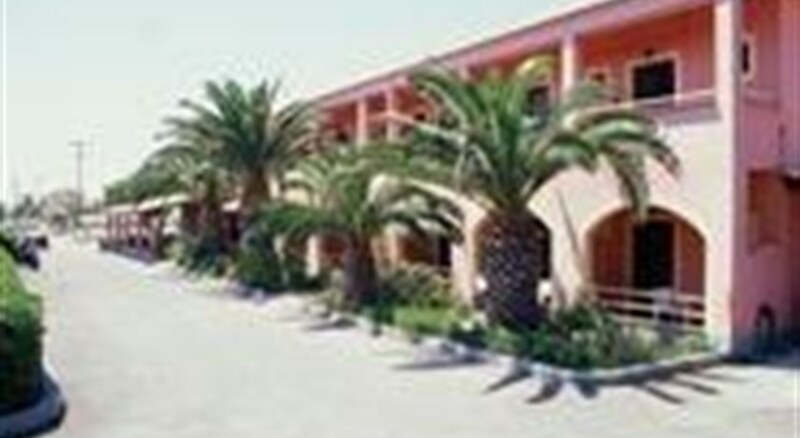 The hotel is merely a half an hour drive from from the nearest airfield, Corfu Airport. Offering a friendly environment, the hotel welcomes guests with a lovely outdoor pool, sumptuous cuisine from a Greek kitchen and lively entertainment and a promise of comfort amidst traditional warm Greek hospitality. Rooms at the Tzevenos Hotel Apts, come with air conditioning, hair dryers, private shower rooms and either a balcony or terrace offering amazing views of the scenic surroundings. Do not miss out on a trip to the Agios Georgios beach while on your stay here. The sandy 4.5km long Blue Flag beach is a huge draw with tourists for its laidback vibe and crystal-clear waters. The beach has soft golden sand sloping gently into the sea so it's great for kids, though guests are advised to beware of strong currents that are seen in this part of the coast. He hotel staff rents out umbrellas and sunbeds to guests. The hotel is close to a host of nice restaurants and snack bars. Parking can be easily found close to the beach. Tzevenos Hotel Apts is mere 1km away from the lovely Issos Blue Flag beach. The Agios Georgios beach lies between Corfu Town and Kavos, right after you cross the village of Argirades to the right. The Corfu Airport is 29km from the hotel. The beach is nice to soak up the sun or try the thrilling water sports on offer. The property is situated on the main road with shops, bars and restaurants a short walk away. There are 25 well-appointed guestrooms spread over two floors in the Tzevenos Hotel Apts complex which has a contemporary design. The Tzevenos Aparthotel has immaculate, well-appointed guest rooms with air conditioning (payable locally), refrigerator, TV, hair dryers, private shower rooms and either a balcony or terrace offering amazing views of the scenic surroundings. Tzevenos Hotel Apts arranges a massive barbecue (Greek sausage, chops, burgers, potatoes, rice, salads, tzatziki, bread, dips and fruit). You can order a carafe of wine with the meal you order. The hotel has a poolside snack bar serving a range of light bites and drinks. There are good bars and restaurants nearby. Tzevenos Hotel Apts has an outdoor swimming pool surrounded by loungers and parasols. There are live Greek band with excellent singers, traditional dances putting up a live show at the restaurant where guests can also join on a lit-up floor. Guests can relax with refreshing drinks from the bar, which can be enjoyed while lying back on a lounger. During evenings, the entertainment staff puts up a great show that includes Greek nights, Karaoke and quiz nights. Guests can play pool or watch Sky TV at the pool bar showing all popular sports events and football.